In September 1862, Confederate General “Stonewall” Jackson used Loudoun Heights as a staging ground for the bombardment of the picturesque—but also strategic—town of Harper’s Ferry, West Virginia. 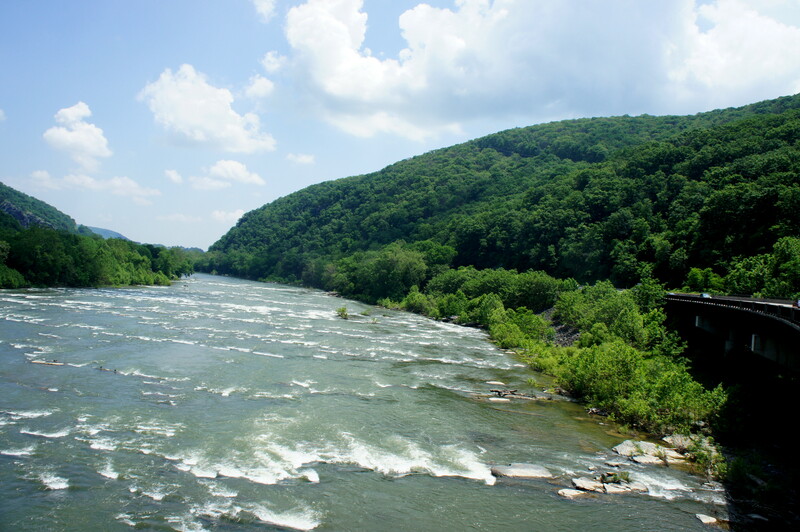 Today, remnants of the Civil War have mostly disappeared from the ridgetop, but spectacular views of Harper’s Ferry and the confluence of the Potomac and Shenandoah Rivers endure. 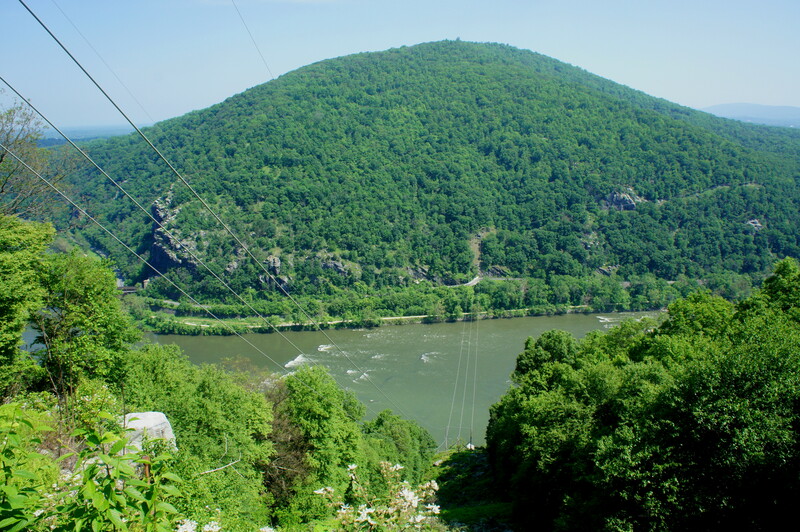 The ascent of 3+ miles to Split Rock on Loudoun Heights rivals neighboring Maryland Heights for the most challenging hike in Harper’s Ferry National Historical Park and comprises one of the three finest viewpoints in the area (the others being Maryland Heights and Weverton Cliffs). On a usual day, Harper’s Ferry is less than a 1.5-hour drive from Baltimore or Washington, DC, making it a popular spot to visit. 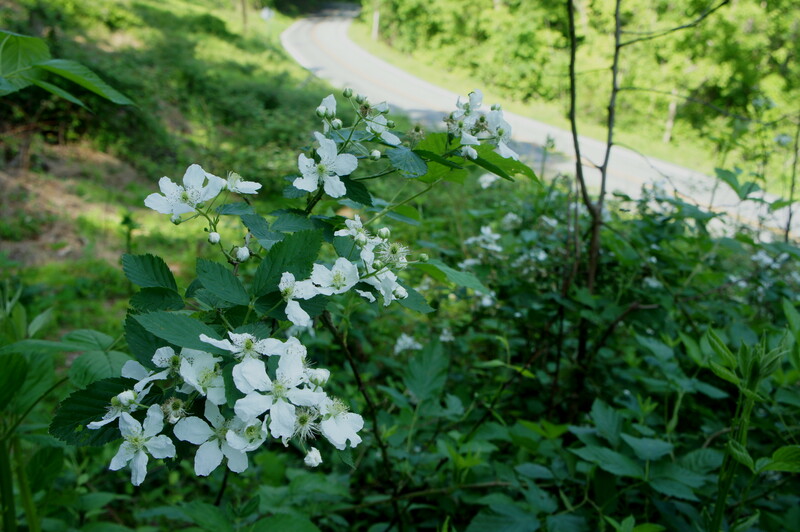 The best starting point for the Loudoun Heights hike is situated at the junction of Shenandoah Street and West Virginia Route 340, just after the latter crosses the Shenandoah River. Here a small and often crowded parking area fits perhaps 2-3 dozen cars. 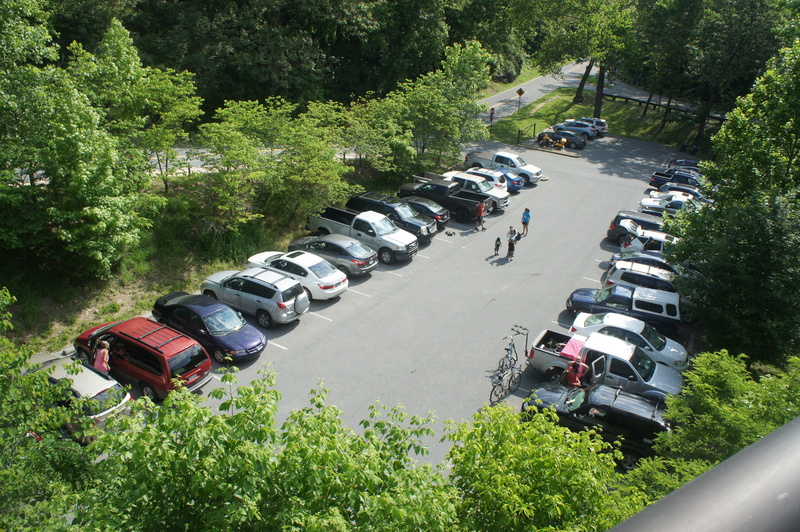 Assuming you are able to find a parking spot, face north—toward Shenandoah Street—and bear left on the sidewalk, following the sign marked “Appalachian Trail junction, 200 feet.” After, well, 200 feet, bear left again at the next marker—to “Loudoun Heights Trail, 1.4 mi.”—and cross the lengthy bridge over the Shenandoah River. As cars buzz past on your right, look off to the left for kayakers and rafts navigating through the minor rapids below. 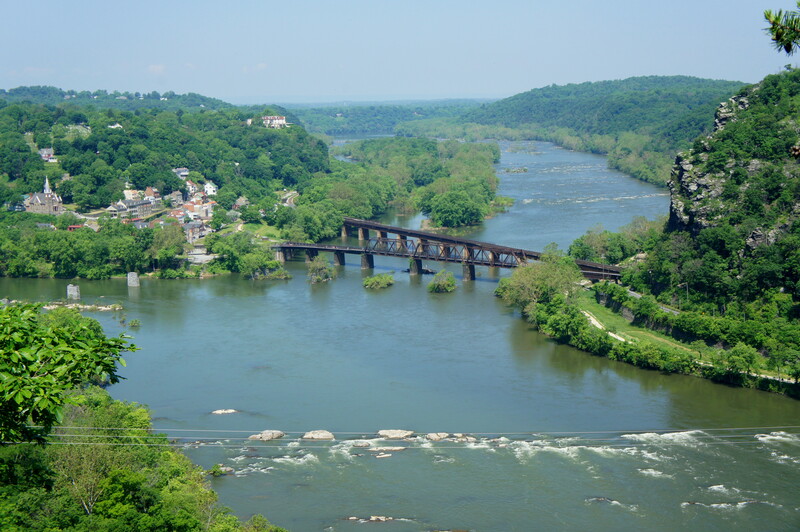 Maryland Heights and Loudoun Heights—the latter the towering mountain on the right—dominate the landscape to the east, but the town of Harper’s Ferry, tucked away at the confluence of the Shenandoah and Potomac, remains mostly concealed from view. As the route skirts a rock face and rounds the bend, the uphill climb begins in earnest. The AT bobs and weaves in and out of wavy nooks in the hillside—including one that often bears water in springtime—all the while relentlessly gaining elevation. After a brief respite at 0.6 miles, the south-bearing trail dips into a minor ravine then climbs again, leaving the Shenandoah River behind. Chestnut oaks, black gum trees, maples, and dogwoods abound. By now the AT has gained around 300 feet in about 2/3 mile. The next ½ mile covers another 500 feet at a steeper and more difficult pitch. Immediately after Chestnut Hill Road, the footpath ascends through a thicket of flowering shrubs and back into the woods. After a couple minutes, the undergrowth becomes sparser, and the trail crosses a man-made channel for guiding water down the hillside. Overlooking the old channel on the left, the AT climbs steeply and relentlessly up the ridge, switchbacking at two points, to meet the Orange Trail at 1.3 miles. (Note: The junction is easy to miss, as there is no sign—only a couple of orange blazes—indicating the start of this trail.) Stay right on the AT—you will return via the Orange Trail later. 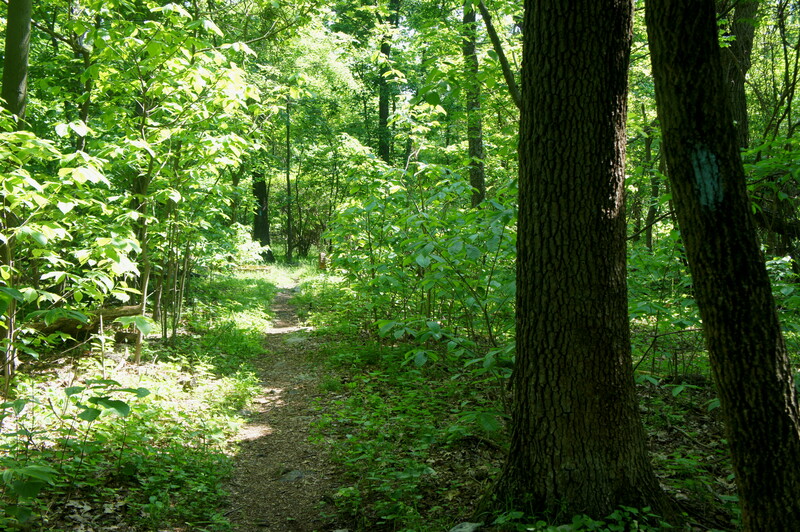 The trail fork is notable for a third reason as well, as it effectively straddles the border between West Virginia and Virginia, and the Blue Trail viewpoints dips in and out of both states several times en route to the Loudoun Heights viewpoints. The Blue Trail is considerably narrower than the AT but relatively easy to follow. 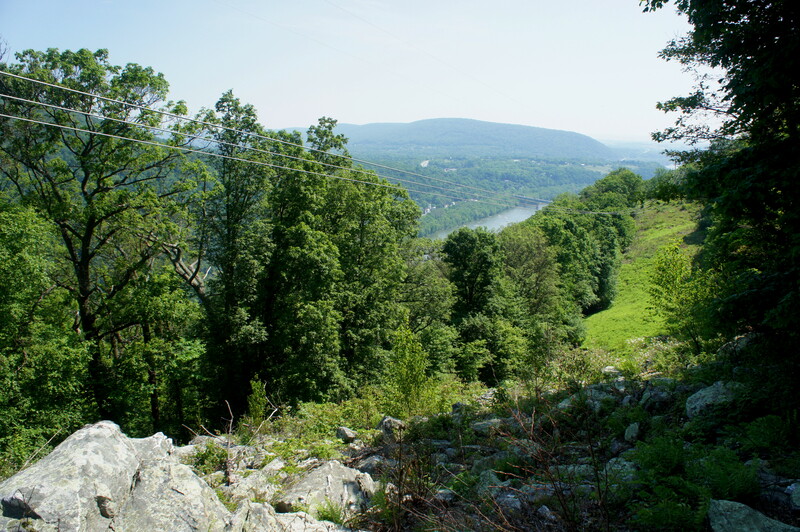 While following the ridgeline, views of Harper’s Ferry to the north and Loudoun Valley to the south are almost entirely obscured by dense tree cover. At 1.8 miles, the trail passes one of three infantry blockhouses constructed on Loudoun Heights by Stonewall Jackson’s men in 1861 as Confederate forces took up positions in advance of the Battle of Harper’s Ferry a year later. Today, the house is effectively reduced to ruins, but one can imagine that it commanded a strategic position for the forces that went on to win the battle—but to lose the war. Continuing northwest, the Blue Trail descends at a gradual pace and, at 2.1 miles, meets the Orange Trail at its eastern end. Stay straight on the Blue Trail, but take heed now, as you will want to catch the Orange Trail here on the way back. (Note: Again, the trail is poorly marked with only a couple orange blazes on fallen tree logs.) Beyond, the Blue Trail starts to descend at a more rapid pace, dropping about 100 feet en route to the first of the three overlooks. Swinging east to the Virginia side, the path eventually bears northward again into West Virginia. 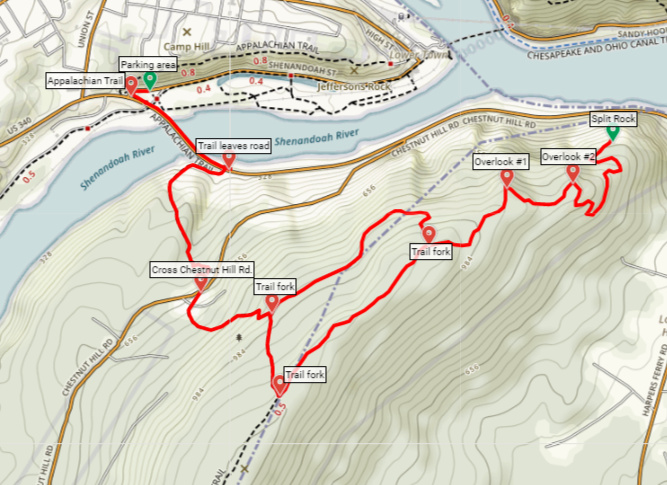 Look for a short spur trail heading left at around 2.4 miles. This is Overlook #1. The viewpoint is situated almost directly below a sweeping set of power lines, affording vistas that probably would have otherwise been obstructed. 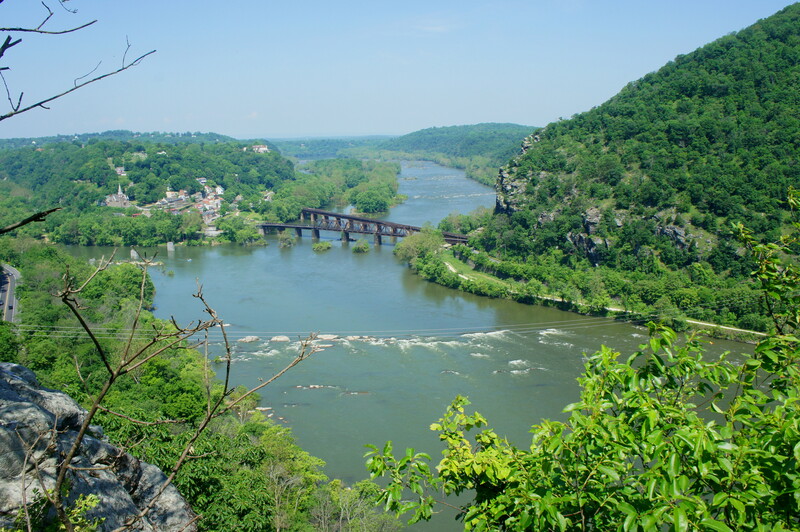 While the associated town of Bolivar is visible to the west, Lower Town of Harper’s Ferry remains obscured by tree cover. And so it is on to Overlook #2, situated down another 100 feet—and ¼ mile walk—from the first overlook. This viewpoint has even more limited vistas, with no view of Harper’s Ferry at all to the west—but a cut in the trees (again due to the presence of power lines sweeping down into the valley) nicely frames jagged Maryland Heights across the Potomac River. It’s worth continuing on to the final—and best—viewpoint at Split Rock, situated another 150 feet lower. From the second overlook, the Blue Trail snakes down the shady hillside and passes at least one prominent rock formation: a triple-decker boulder sitting precariously at the precipice of a ledge. 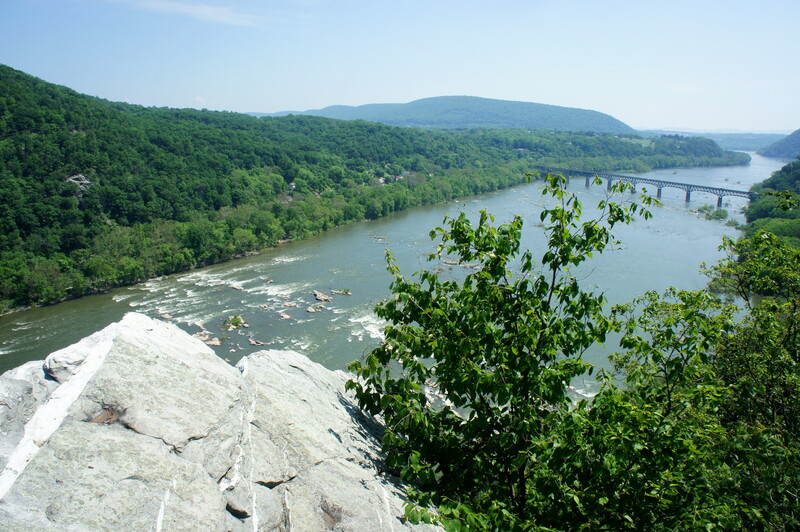 At last, at 3.2 miles, the footpath ends at Split Rock, boasting Loudoun Heights’ best views of Harper’s Ferry. 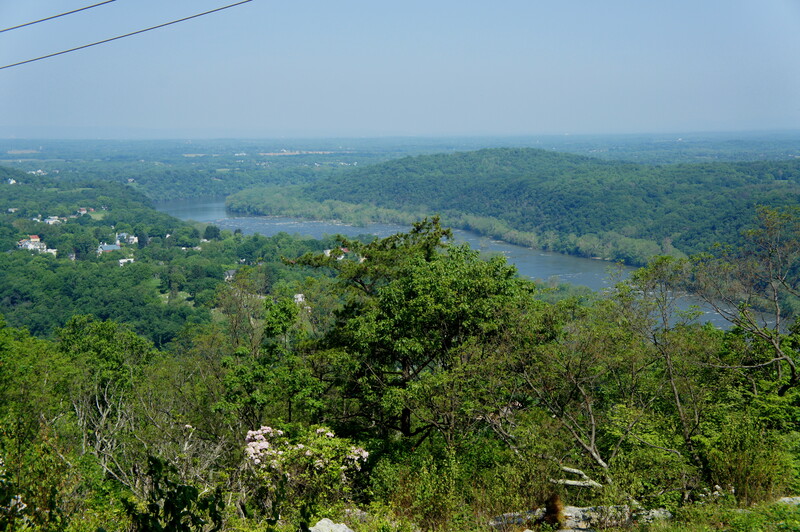 At the overlook, look west to Lower Town and the confluence of the Shenandoah (left) and Potomac (right) Rivers. Crossing the Potomac are two bridges—the old railroad route and new—making for a postcard-worthy picture with the quaint town and church steeple beyond. 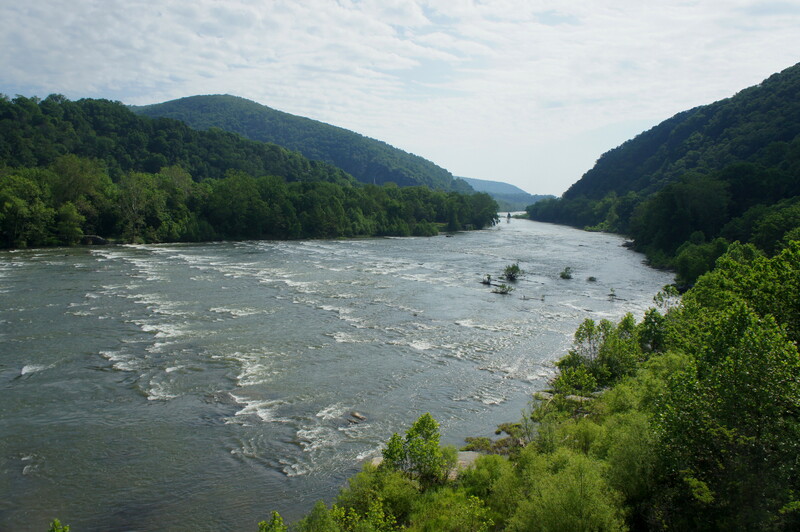 To the east, peer down the Potomac River to the Route 340 bridge and South Mountain, home of Weverton Cliffs and the northbound continuation of the AT through Maryland. Rounding out the picture, straight ahead is Maryland Heights, where the railroad disappears into a lengthy tunnel under the mountain. Split Rock itself is a jumble of quartzite situated on the precipice of a 300-foot near-vertical drop. Here the Blue Ridge Mountains—part of the 360-million year old Appalachian Range—are disrupted by what’s called a “water gap”: the result of millions of years of pressure from the Potomac River, which eventually whittled away at the rock as it worked its way east toward Chesapeake Bay. For the return route, retrace your steps on the Blue Trail for a mile, keeping a keen eye out for the start of the Orange Trail on the right. (Note: The junction is situated about 1/3 mile past Overlook #1 and just before the Blue Trail enters a sunny patch. Look for orange blazes on two fallen logs on the right.) The Orange Trail provides a shortcut—and some variety—back to the trailhead, though it is largely devoid of overlooks and points of interest. 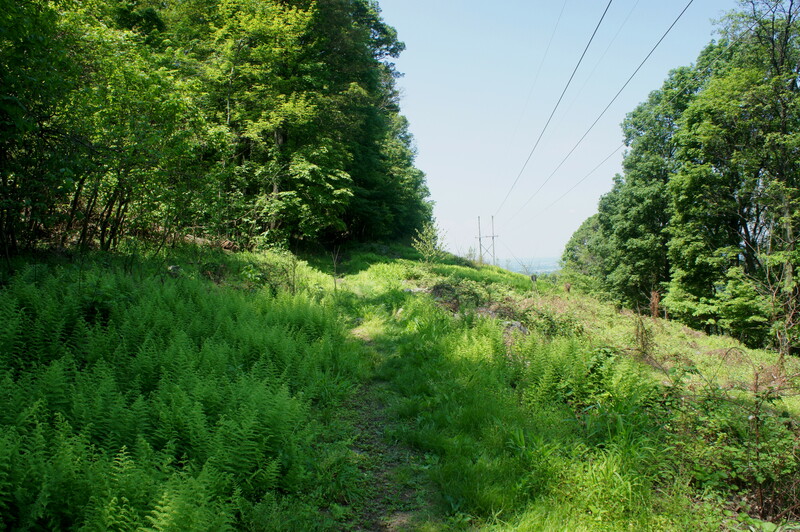 The trail begins by dropping down the north slope of Loudoun Heights, rounds a single switchback, then descends a steep pitch as it bears southwest. At 4.4 miles—1/4 mile from the start of the Orange Trail—hikers will briefly reemerge into the sunshine at the power line cut before ascending again into the woods. Follow the trail for nearly ½ mile back as it bears southwest to the western junction with the AT, first encountered an hour or two ago. 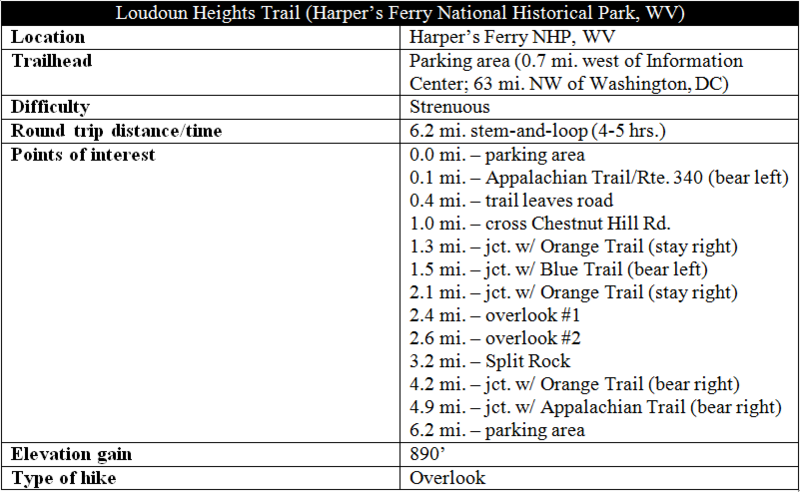 This entry was posted in Civil War, Harper's Ferry National Historical Park, Strenuous Hikes, West Virginia and tagged Appalachian Trail, Blue Trail, Civil War, Harper's Ferry, Harper's Ferry National Historical Park, historic, Loudoun Heights, Loudoun Heights Trail, Orange Trail, Potomac River, Shenandoah River, Split Rock, Virginia, West Virginia. Bookmark the permalink. Thanks for your trail report. I brought back many fond memories of my years as PATC overseer on the trail from the US 340 bridge to the crest of Loudoun Heights!